A drone crash can be catastrophic no matter where it happens, but watching your expensive toy plummet into a lake is especially tragic because water and electronics don’t mix. 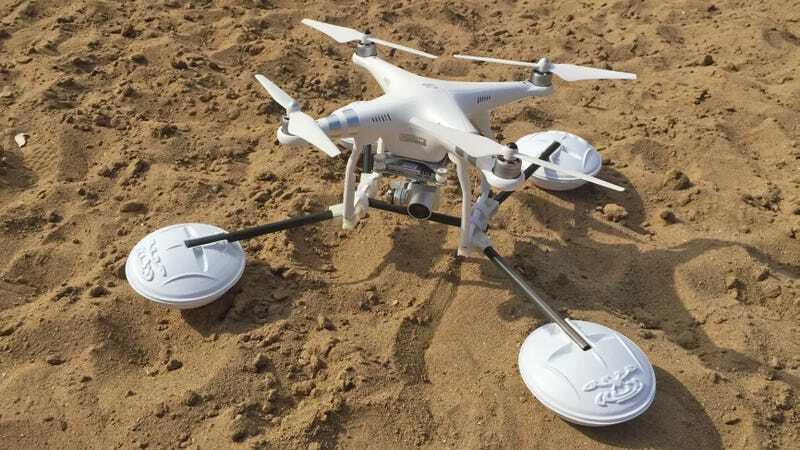 There’s now a relatively simple way to ensure your drone survives an unexpected water landing, though. The inspiration? Insects. Water striders, or Gerridae, are best known for their remarkable ability to skim across the surface of a pond using their long legs to displace their weight. The aptly-named WaterStrider, designed for use on the popular DJI Phantom quadcopters, adds a set of four buoyant pods on the ends of its own outstretched legs, which allow it to float on water, even after a less-than-graceful landing. Overkill safety has a price. There’s a good reason DJI doesn’t include oversized buoyant feet as a standard feature on its drones, though. The WaterStrider rig weighs slightly less than 300 grams, which is comparable to a Phantom carrying an extra battery which weighs in at 352 grams. That not only means about a 30 percent reduction in flight time, but a compromise in aerodynamics as well. If you’re trying to fly on a windy day, your Phantom will be more susceptible to being bounced around by the winds with this hanging beneath it. But that’s why it’s not designed to be a permanent addition to your craft. The WaterStrider legs can be quickly attached and removed as needed using a set of Velcro straps, so if you’re confident about not crashing, you can recoup that extra flight time. Retail pricing is expected to be around $239, but if you want one sooner, and cheaper, you can pledge $179 to the WaterStrider’s Kickstarter campaign. Delivery is expected as soon as July, assuming the creators reach their $22,500 funding goal, and everything goes according to plan when it comes to production. It’s not as cheap a solution as just sticking pool noodles on the bottom of your craft, but why trust your expensive toy to you amateur arts-and-crafts skills?